The sky above the campground in Plaisance Provincial Park in Outaouais, Quebec is aglow in pink hues amongst the clouds at sunset. A thin layer of clouds highlighted in pink span across the sky at sunset over the campground at Plaisance Provincial Park in Outaouais, Quebec in Canada. 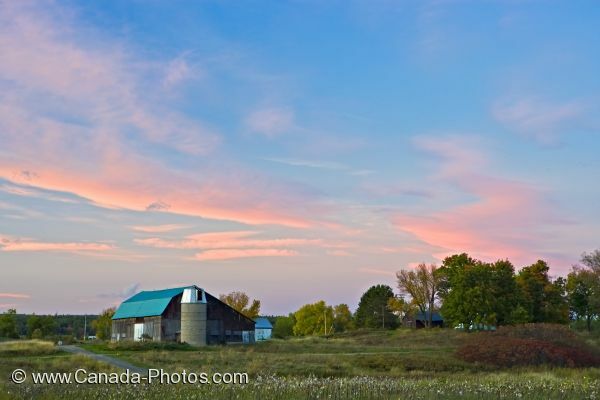 Farmland is what makes up a majority of the landscape in Plaisance Provincial Park and visitors staying at the campground will find barns scattered around them. Camping in Plaisance Provincial Park is a relatively cheap holiday which requires a tent and a sleeping bag. For those who prefer to get off the ground while camping, there are spots for campers and RV's. Plaisance Provincial Park in Outaouais, Quebec is open from late May until the middle of October and covers an area of approximately 28 square kilometers. Within this range, visitors will find islands, peninsulas and marshes along the Ottawa River and various types of plant life and wildlife. Picture of a sunset over the campground in Plaisance Provincial Park in Outaouais in Quebec, Canada. An endless list of outdoor activities include those such as camping, cycling, hiking, swimming, canoeing, fishing and kayaking. The perfect getaway surrounded by tranquility while staying at the campground where the sunset scenery is stunning. Sunset over the campground at Parc de la Plaisance, Plaisance, Outaouais, Quebec, Canada.